Did you hear that today is Charles Dickens 200th birthday? What better way to celebrate than by highlighting one of my (and certainly his!) favorite things: bookshelves. To be fair, the two projects I applied this to today don't actually hold books, though the latter will once we get another DVD rack, however they're still bookshelves! Our house is actually overrun with bookshelves. We have zillions, and still we don't have enough spaces for all of our books. It's kind of shocking, actually. Now I'd love to take credit for this project and say it was my idea, but it wasn't. 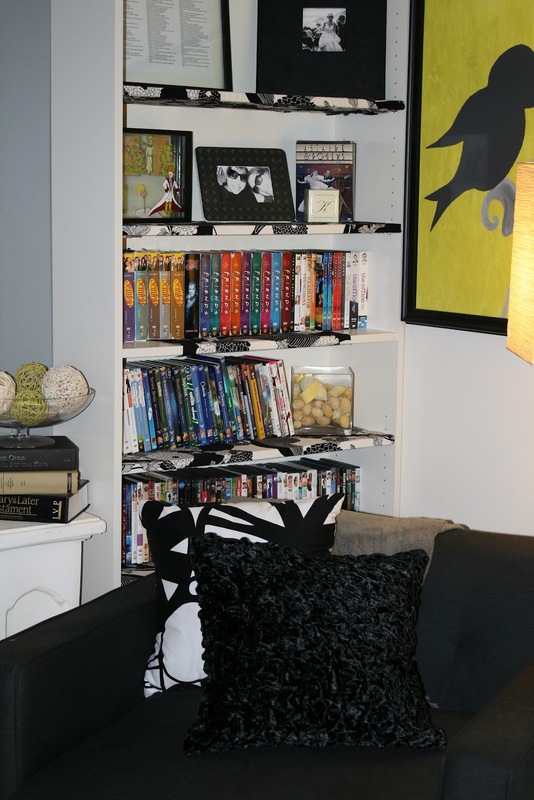 I saw it in an Ikea catalog and thought it may be something fun to do with some of the shelving units in our home, specifically in our living room. I still had some (though now we're down to just *one* remaining fabric...) material left over from our homemade (big mistake) photo booth at our wedding. It's kind of a tricky pattern. It works in small doses, but large scale it isn't as nice. I've been looking for something to do with it for a long time now and I think this was absolutely perfect. 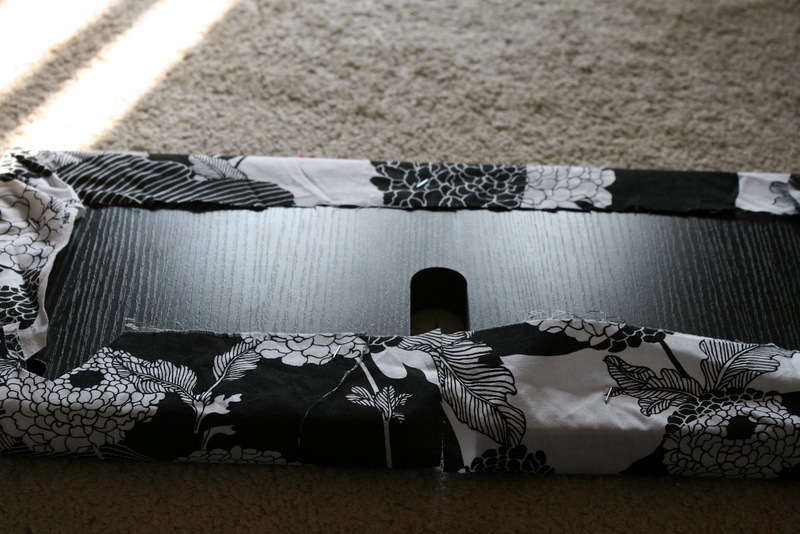 For this project, you'll only need material and a staple gun. Sooooo easy. I have some alternate ways to use this at the bottom, too, so make sure you check it out. First we made over our coffee table. There wasn't anything wrong with it, really, but there were some wax stains on one of the shelves and then a massive chunk was taken out of the other. I thought this would be a good way to cover that up, and it was. 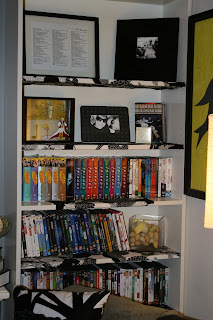 I liked how it looked and had so much fabric left over that I decided to do the bookshelf in our living room as well. Let's get started! 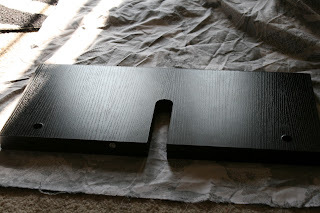 I'm going to do the steps using the coffee table, which was harder than the bookshelf. 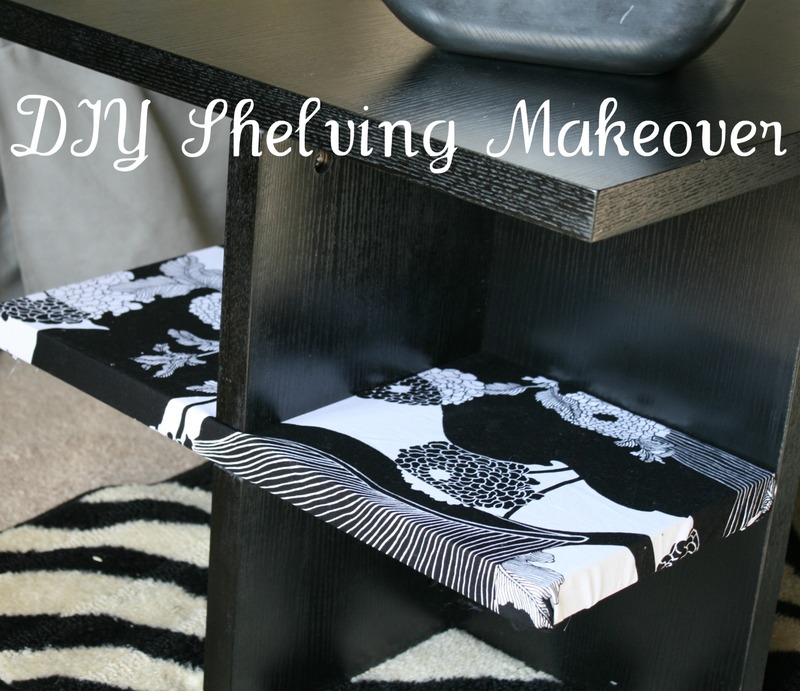 (1) Lay your shelf out. Lay your shelf on top of your fabric and decide how much you'd like to cover. 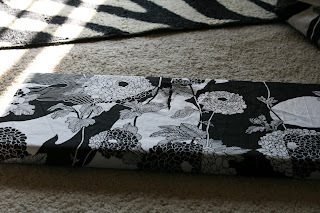 I recommend covering the entire shelf, like a wrapped present. It looks much cleaner. 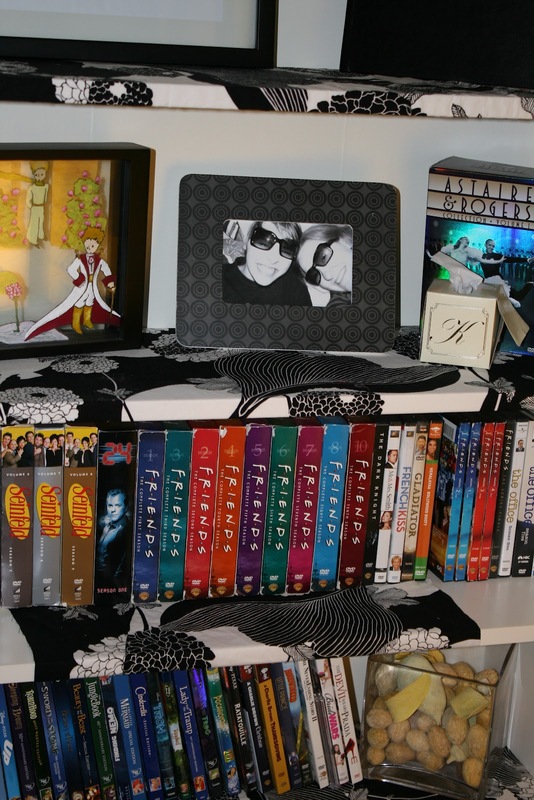 However, you can always just do a middle section- like we did on the third shelf in our bookcase. If you aren't going to cover the whole thing, remember to hem or fray check the edges of your fabric. (2) Staple it. You know this looks much better if you iron the fabric first. I'm not sure why I didn't do that, but hey... if your fabric is wrinkled, you should iron it. Then, staple! I start with one side at a time and then do the side directly opposite of it. Remember to pull realllyyyy tightly. Be careful around the edges, too, you don't want it to bunch up too much. (3) Add it. Throw the shelf back on! This may mean needing to cut out fabric where screws should be, etc, or it may just be laying the shelf back down (as was the case for my bookshelf). 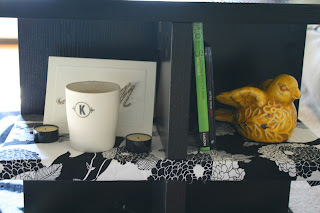 For my coffee table, I ended up putting masking tape down at the point where the shelf slide into the table. The fabric kept catching and bunching up, but the tape solved that entirely. You can peel off the visible part once your shelf is in place. 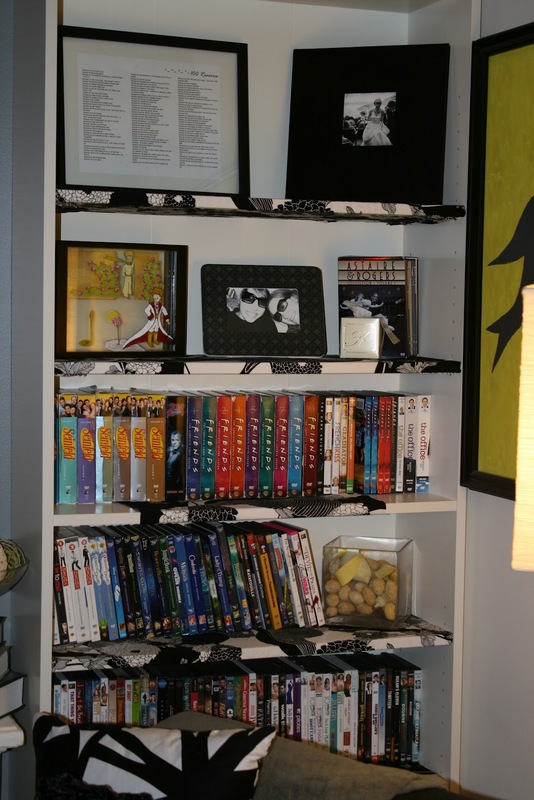 There were some differences with the bookcase. First of all, I wrapped the entire shelf in fabric. With the coffee table, the shelf is SO low to the ground that no one will ever see underneath. Not so with the bookshelf. 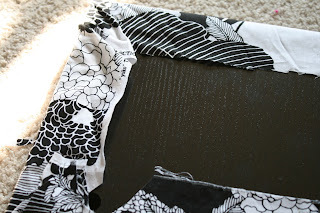 My suggestion is to overlap the fabric on the underside. There are so many other things I want to do with this. 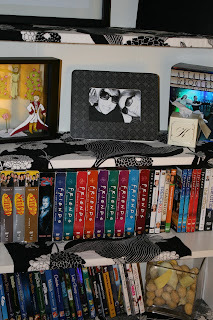 I plan on doing the *entire* DVD bookcase in fabric. The only reason I didn't do it with this one was a) not enough fabric and b) I would have had to disassemble it. I also got a little table top from IKEA for our sewing machine, which I'm going to fabric over as well to make match the room it's going in. I LOVE fabric! I hope you're inspired by this and see all sorts of wooden pieces in your home that can be so much more lovely with a touch of material. There's ONE more thing I need to mention today... Charles Dickens may be 200, but my sweet little niece, Lilah is having her very first birthday! Lilah is a precious little darling and I absolutely love her. She's a joy and a delight. And she looks *exactly* like my brother. Her big sister, Penelope, seems to really favor her mother, but Lilah is a dead ringer for my brother. It's incredible. I've never seen anything like it. Lilah is a very special blessing to our family. She was born 5 weeks early, and just in time to meet her Great Grandpa. He died about 3 weeks after she was born, and his body was really shutting down for the latter two. I really believe that God sent Lilah early because he knew that her Great Grandpa was leaving earth. My Grandpa and my brother had a very, very strong bond. I think they both would have been devastated if Grandpa couldn't have met Lilah. 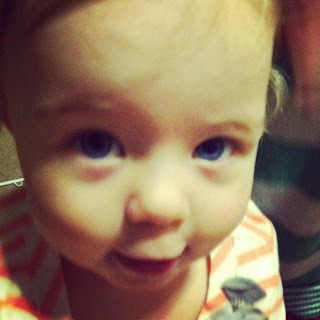 So, little Lilah Bean- happiest birthday wishes for your Auntie Auna! I love you so, so much and I can't wait to cuddle you up and celebrate your life! I hope you have a beautiful day. As always, thanks for reading! Really liked your shelf and coffee table,its a great way to add style to your home.Your little niece is precious,I feel it was no coincidence your nice getting life and her great grandpa going home.